This needs a word of introduction and a word of warning. J. M. Coetzee’s novel Foe is a reimagining of Daniel Defoe’s famous novel, Robinson Cruso, told from the perspective of a woman named Susan Barton, who finds herself a castaway on the island of Robinson Cruso. After spending a year with Cruso and his cannibal slave Friday, Susan is saved and comes back to England where, in order get her story published, she enlists the help of Mr. Foe. I am convinced that the title of the novel refers to the intellectual sparring between Defoe (Mr. Foe) and his muse, though I am amused by the thought that it could also have referred to a reader’s unsuccessful efforts at trying to “place” the characters of the novel. This post is about that latter interpretation of the word “foe” as someone whose essential nature is difficult to understand. At this point, a spoiler warning is appropriate for those who haven’t read the book yet and wish to preserve the surprises for later. The first foe in the novel I want to talk about, is the writer Mr. Foe. His motivations as a writer are unclear, and one does not know whether he is interested in recounting true adventures or in recounting interesting versions of those adventures. The reader finds out that it is probably the latter. Having encountered his muse, he is not enthused as much by the story of Susan’s experiences on the island as he is by Susan herself. Accordingly, he presses Susan for details of her past life, against her wishes. I was disconcerted by my inability to get a foothold on the character of Susan’s daughter, and the only way I can resolve the appearance of little girl is by saying that Mr. Foe created her to furnish Susan with *his version* of her past. It is sometimes exasperating that Foe does not want to write the story that Susan wants to tell him. The next foe is Susan Barton, who recounts her singular fate to Mr. Foe in a series of letters. 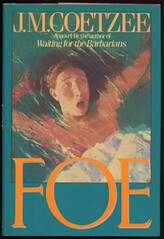 It has been said that Foe is a didactic novel about the creative process, and nowhere is this seen more clearly than in Susan’s letters. My favorite parts of the novel are those in which Susan discovers gaps in her narration and ponders frequently on the possible answers to questions like, “How did Friday lose his tongue?” Considering the period in which the story happens, and looking at the earnestness with which Susan pursues her questions and spars with Foe, it is clear that feminism is one of the themes of this novel. How would the story work if Susan had been a man? Would he have had the patience to bear the silent, shadowy presence of Friday for as long as she did? As a reader, I too ached to know about Susan Barton’s past: What were her experiences in Bahia, where she went to look for her daughter? How did she come to sleep with the captain of the ship which was eventually sunk by mutineers? Is her initial callousness to the daughter Foe creates for her, an indication that she has come to terms with her loss? And here, I pause to examine a contradiction: How easily can I, as a reader hold Mr. Foe to a particular set of rules while I flout them myself! I wonder if this trap was Coetzee’s intention, and if it was, I marvel at his ingenuity. Cruso, in this novel, is a somewhat lesser foe. In this retelling, he is already on the island, toward the end of his exile. He is past middle-age, not heroic but resourceful. But he is an enigma: He does not seek out ships on the horizon, leading Susan to wonder whether he has lost the desire to be saved. He seems bent on leading a harsh life, where a few more tools could easily have improved his existence. It is difficult for Susan to know what he means by his claim: “Not every man who bears the mark of a castaway is a castaway at heart.” It could mean that he has indeed accepted his fate and does not feel the need for escape. Or it could mean that he seeks to insulate himself from it by staying in the present moment, working on strange projects like leveling terraces with no hope of agriculture in their future. Or it could mean that, during his long isolation, he has become an animal of the island, neither liking it nor hating it, but continuing to survive as long as possible. The last foe is the man Friday, a foe because he has lost his tongue and cannot express himself in any way other than a few discordant notes on a flute and a crazy dance. We wonder, like Susan, whether Friday’s misfortune is a result of torture by his colonial overlords, or if Cruso laid down the law of master and slave by an act of cruelty. A constant fixture through the book, Friday, and his unknowable past, grows to become its central point of discussion, its great void. Without a doubt, Friday symbolizes the elusive unknown in the creative process. How often does a writer, or a scientist, try to get their hands around an idea, to nudge it, and poke it so that it can yield its secrets ? How often are their efforts thwarted ? Friday also represents the disconnect between “wild” Africa and “civilized” Europe. As Foe wants Susan’s backstory, so Susan wants Friday’s backstory, but all her efforts at communicating with him are futile; they seem to live in orthogonal worlds. And here again, the previous contradiction manifests itself: Susan is irritated at Foe for concentrating on her past and not on her island experience, yet she tries her level best to extrapolate Friday’s past. Has Friday then, become Susan’s muse? Finally, the most formidable foe is Coetzee himself. The novel, which starts off as a narration of an experience, becomes more complicated as it progresses. But nothing really prepares you for the final chapter, which is told by an entity other than Susan, or Defoe. Who that entity is, is unclear. Events from the past (the wreackage of Cruso’s ship) and the present (Susan, Friday and Defoe in the latter’s apartment) are melded into a dream-like sequence, much like the concluding reel of 2001: A Space Oddyssey. My imagination, by now thoroughly impoverished by the effort of understanding the story, says that the narrator of the last scene is Coetzee himself, looking at his characters without the constraints imposed by causality. If so, there is no indication that he resolved anything from this melding of time and space. Perhaps he decided to renounce his questions, and to just let the characters be.